Converting single-pay members to sustainers and upgrading sustainers to higher levels of giving are two of the best ways to increase revenue throughout the year. The earlier in the fiscal year you begin, the more the revenue will compound throughout each year and into the next. Upgrading donors in small increments over time has proven to be more effective than attempting to leap donors up to a higher giving level. For example, asking a $5 a month donor to upgrade to $7 is more likely to stick than asking them to upgrade to $10 or $15. Asking a $10 a month donor to upgrade to $12 or $13 will gain more overall success than asking them to upgrade to $15 or $20. And don't be afraid of asking for odd numbers. To get an idea of how this works, if you have 20,000 sustainers in your program and upgrade 10% of them by a dollar a month, that's just $2,000 up front. However, after 12 months, that's an additional $24,000 in revenue. At an 85% retention rate, over the course of three years, you'll realize $61,640 that you wouldn't have had without the upgrade initiative. Likewise, if you can convert a $100 annual donor to a $10 a month sustaining donor, not only have you insured better retention year after year, but you've boosted your revenue from this donor by 20%. 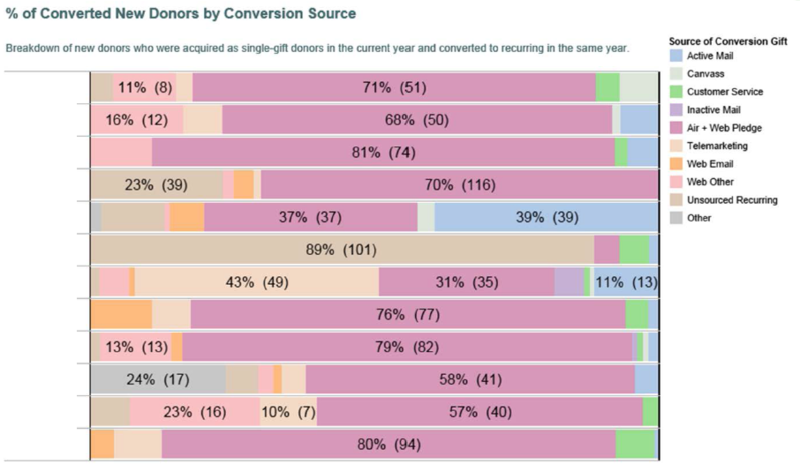 Target Analytics has prepared this chart that shows how new single gift donors are currently converted to sustaining donors in the year they were acquired. Sustainers are your most loyal and committed members. They value your station and believe in it. When they become sustainers that is just the beginning of their giving. If asked occasionally – and thanked appropriately – they will continue to increase their support. The frequency of when and how often you solicit them depends on your particular station. One approach is to review your annual development plan and choose a limited selection of solicitations to include sustaining donors in (be sure they are receiving all cultivation communications.) For example, if you send four additional gift direct mail appeals annually, conduct quarterly outbound telemarketing calls, and send monthly emails to your general members, you might choose to include sustainers in the two best direct mail and telemarketing campaigns, and send upgrade emails during on-air drives. The frequency of upgrades should be in direct correlation to the frequency of your membership solicitations and the assertiveness of your overall fundraising strategies. For some stations, twice a year is plenty, and for other stations, asking sustainers to upgrade every other month through various channels can be extremely effective. Reviewing performance and weighing it with complaints will help determine the balance of how often to upgrade. Keep in mind that some sustainers will continue to increase again and again, while others will only upgrade their giving periodically. An effective method to focus on the best donors to approach is to adapt your segmentation to suppress anyone who has upgraded or downgraded in the prior three months. (When cultivated effectively, many new sustainers will upgrade after just three months so you can include them). Particularly when asking for an upgrade, it is essential to connect with your donors and remind them of the impact of the support they already give. Be sure to thank sustainers for their ongoing support. Share key examples of what their support made possible (recent popular programs). And then show them how their increased support – or loyal monthly support if asking for a conversion from one-time to sustainer – will make an even greater difference. Examples and samples can be found in the telemarketing, on-air, and direct mail sections.